The green fairy is now legal in the United States! 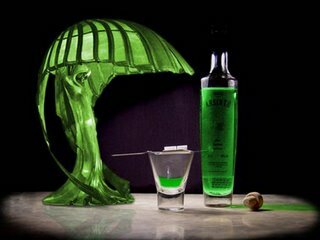 Absinthe, the wormwood (long believed to be a hallucinogenic) and anise spirit with its unusual glowing green color and flames abound, is now not only sold in bottle form, but one can make their own lollipop version with our handy DIY link below. This mysterious spirit was rumored to drive belle époque artisans mad, numerous artists and writers living in the late 19th and early 20th century featured absynthe in their works, even adding the addictive liquid in with their paints. 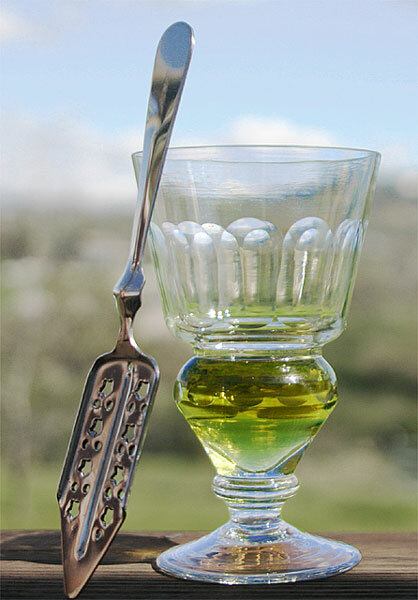 The flame is a twist on the absinthe preparation ritual, though a special slotted spoon is often needed to produce the cloudy, milky effect. We at Deco Belle found a Toulouse-Lautrec family crest spoon in this great shop in Berlin to complete the ritual in its entirity. Hermann was quite helpful with teaching us all about this mysterious liqueur. Wir lieben dieses Geschäft! 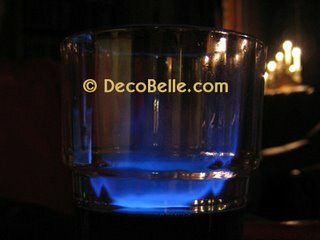 This intense colored spirit is portrayed as a dangerous drug. The chemical thujone, present in only small quantities, was blamed for its alleged harmful effects. Although absynth was vilified, no evidence has proven it to be more dangerous than ordinary liquors. 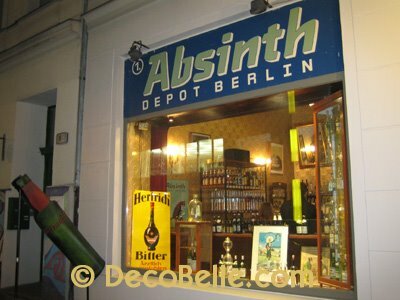 A revival of absinth began in the 1990's in the European Union, with authorization of its manufacture and resale was, this after its nearly world wide ban in 1915. 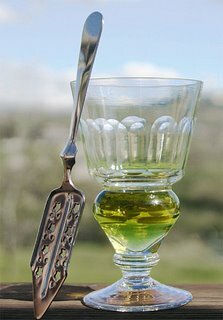 Absinthe tastings are in style as this drink is legally distributed for the first time in a century, people are curious as to what the hype is about. 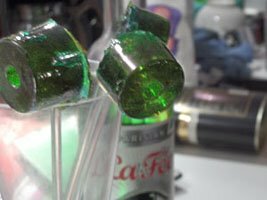 You can enjoy your very own Absinthe lollypops yourself with this handy recipe, DIY absynthe lollipops! La Fee Verte est retournée! DecoBelle.com global jewelry at your fingertips, with our fingers on the pulse on the good tasting world treats!